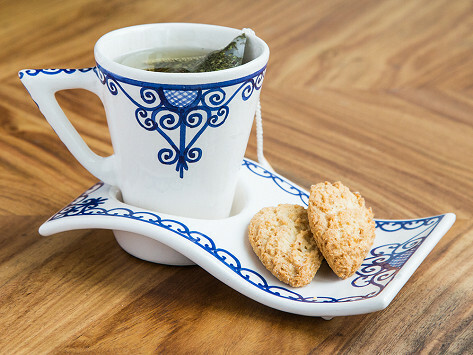 This handmade ceramic mug and coaster set is the perfect duo to support your tea and cookie (or coffee and a muffin) while you support local Tunisian artisans. They craft each piece for a fair wage in Neapolis, a city that’s been making renowned ceramics for centuries. Dimensions: Mug: 5.3" x 3.6" x 4"; Coaster: 7.8" x 4.7" x 3.5"
The unique serving pieces from Kamsah—like their colorful hamsa dish—are handmade in Neapolis, Tunisia. This area is known as the Mediterranean’s ceramics center, with a history that dates back centuries. To support this age-old craft, Kamsah pays the local women who make each piece a fair wage. And they give 10% of their proceeds to organizations benefiting those artisans. 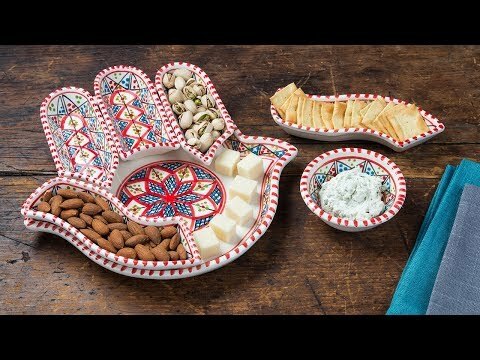 Everything is beautiful and meaningful, from the wave mug and coaster set to the eye-catching sun and hamsa dipping sets (made up of several small dishes that create the hamsa hand). It’s all safe for the dishwasher, microwave, and freezer, and is PTFE- and lead-free, too. We appreciate Kamsah’s help in ensuring the artists and their tradition of craftsmanship continue to thrive. And we think it’s fitting the name Kamsah comes from the "hamsa" symbol, which stands for peace, protection, and prosperity.